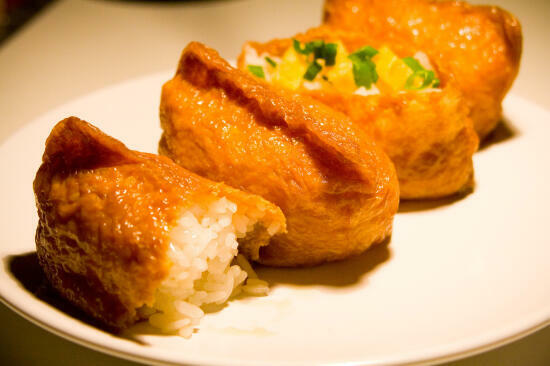 Inari-zushi is a packet of fried bean curd, filled with rice. It tastes better than it sounds, I swear! 🙂 This was the only type of sushi that I ate all throughout my childhood, up until I was a teenager. 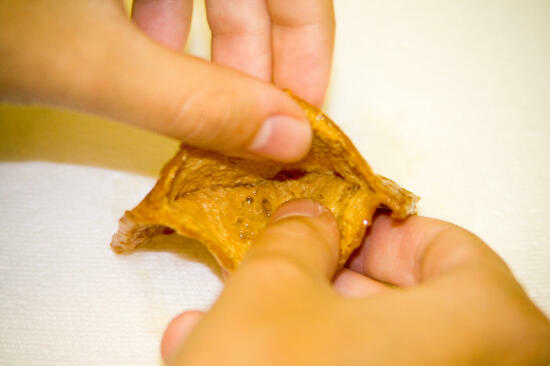 Children generally love inari-zushi, as can be seen by the abundance of names that kids have for them. A few names that my family had for it are soldier hats and footballs. 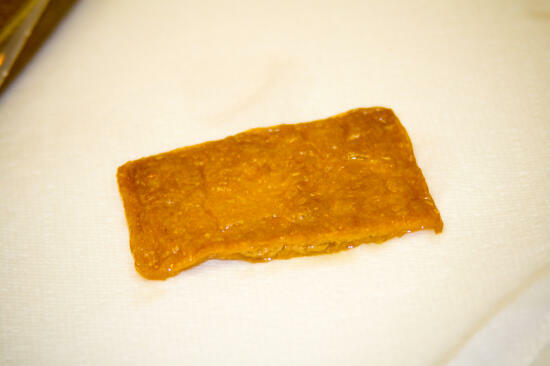 We used to always get inari-zushi when we would go over to my Japanese grandmother’s house, especially on New Year’s. The New Year’s sushi is always the best – we preorder our sushi from this small sushi restaurant in the Japanese area near us, which always has the longest lines on New Year’s Eve! Then comes the wait. We always pick up our sushi on New Year’s Eve, since the sushi shop is closed on New Year’s Day. The boxes of sushi just sit there in our kitchen, tempting us, but we aren’t allowed to touch a single piece! It’s torture. New Year’s comes, and the whole family completely pigs out on sushi! Holidays are always a food fest in my family, eating first around lunch, then snacking all afternoon and eating again before we divvy up all the food between the relatives to take home. I can’t wait until New Year’s! Depending on the package of aburaáge you buy, it might or might not have a small package of sushi vinegar seasoning included. If it does, then you can cook rice and just stir it in thoroughly. If not, cook the sushi rice. 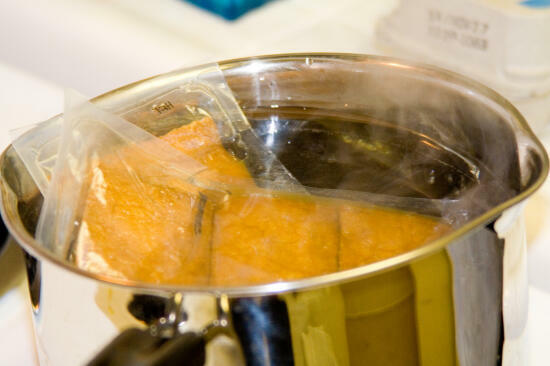 Bring a pot of hot water to boiling. In the package of aburaáge, you will find the aburage in a clear plastic package. Do not open this package. 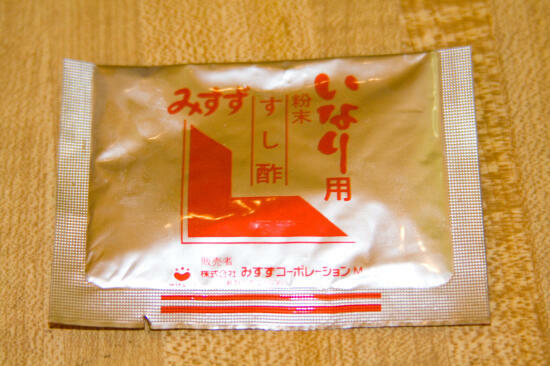 Put this package in the boiling water, and boil for 5 minutes. 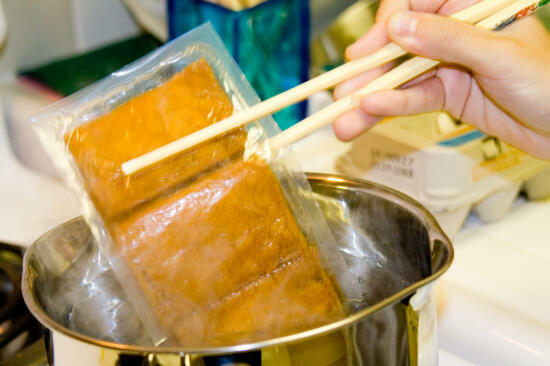 Remove the package from the boiling water, cool for a few minutes. 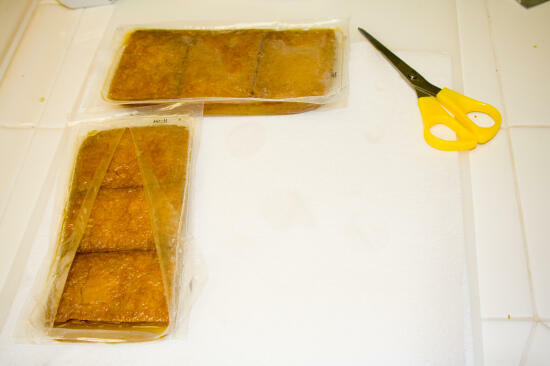 Cut open the package, being careful not to spill any of the juices in the package. For each piece of aburaáge, carefully open from the cut side, being careful not to tear it. Open as fully as possible, to make it easier to fill. BEWARE: the aburaáge will be hot! Fill with sumeshi. 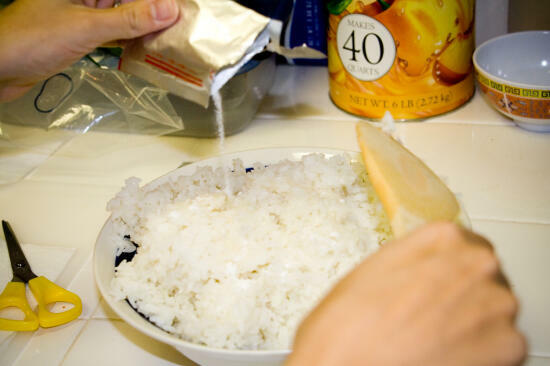 I usually use a regular spoon to fill them, as it is easier to get the rice in this way. We topped ours with tamago and green onion, but traditionally, they are plain or topped with sesame seeds. Eat! You can eat them plain, or with shoyu. one of my favorite types of sushi! 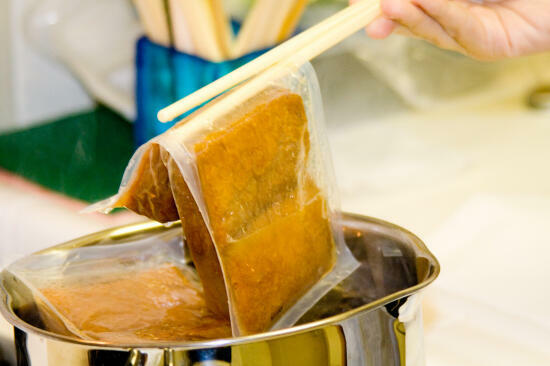 my mom buys the skins by the bag and every now and then, we make some sushi rice and stuff the skins along with various fillings like fake crab, meat floss, tuna, and other random things we have lying around the house. YES! i used to love these footballs. new year’s is the only the major pig-out holiday that can even compare to thanksgiving. my mom’s favorite new year’s feast is to have roll-your-own california rolls and a variety of pre-made rolls, mochi, those good luck beans, those dried up little silvery fish, teriyaki chicken and kanten (jello-like stuff made from seaweed and fruit juice concentrate). Rachel – Yum! 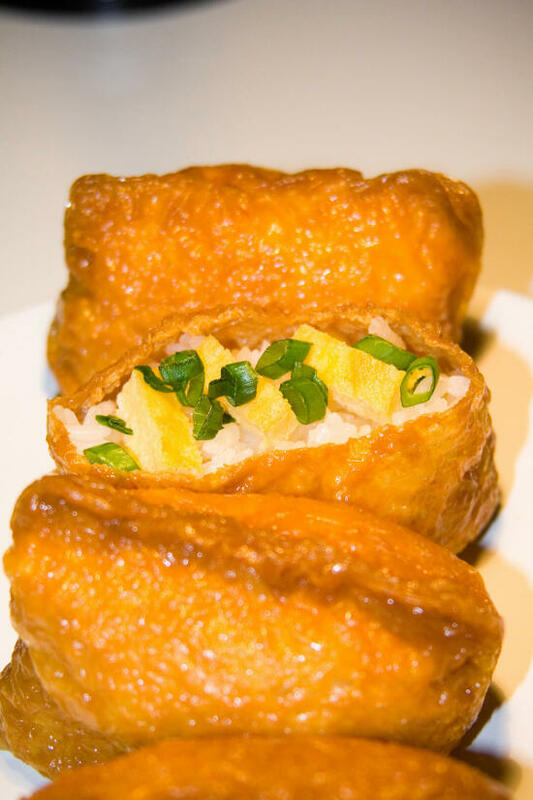 We used to always buy our inari, so I’m really glad we found some skins to start making our own! slackdog – 🙂 Your New Year’s sounds a lot like ours, except that we never used to make our own rolls – we always bought them. Now I really can’t wait for New Year’s! Yummy!!! 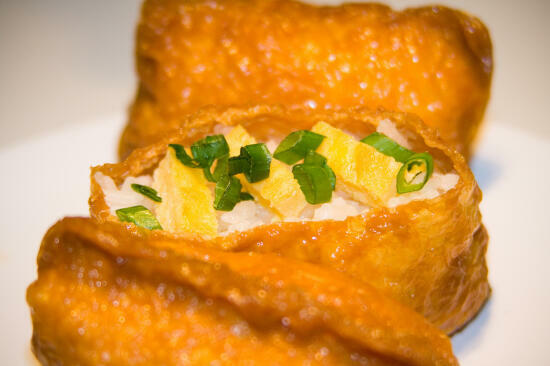 I love inari, I didn’t like tofu much growing up but this one, the skin is lightly sweet and so yummy! Good to know it’s so easy to make, thanks!!! Awesome! I learned something new….I love that! OK…Inari isnt nato is it? I have to confess that I love all things Japanese, except nato. I cant get past the smell. This looks exciting to try! Greg – Yay! No, it’s not nato… I have never had nato, but from what I have heard, it sounds not so appetizing! 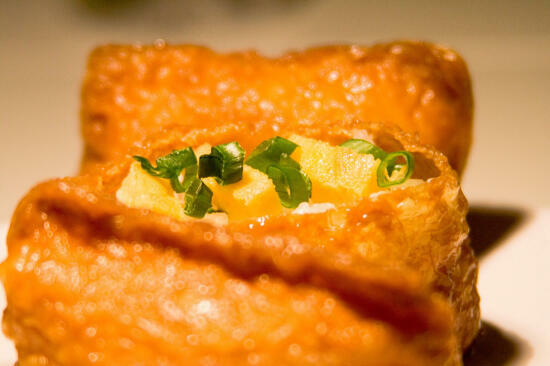 Inari is a type of sushi that even very picky kids (as I once was) will love! I was introduced to sushi and more specifically Inari by my husband a few years ago. We would always buy it from Publix supermarket. Being a beginner; Inari was pretty much the only kind I ate, but unfortunetly for some god- only-knows reason Publix stopped making it so I haven’t been able to find it anymore. The recipe sounds rather simple and I’m more than positive I will give it a whirl, but for those days when I want to be lazy could anyone tell me where I can still buy some premade? I live in the Tampa Bay area. Thanks in advance. I just tried making them. 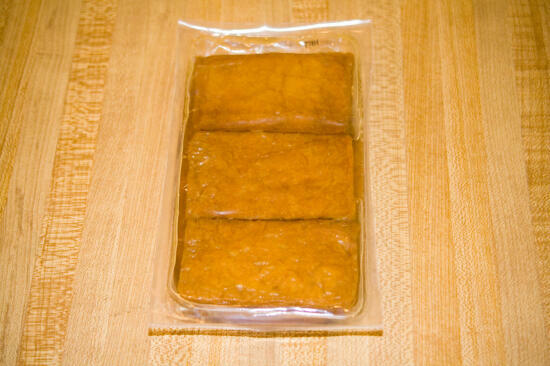 They’re yummy, but i thought they’d be crispy… are they supposed to be kinda squishy, or did I just do them wrong? Maybe I should have tried to get the extra liquid out before stuffing them? Angela – Sorry, I have never been in the Tampa Bay area, so I can’t help you. I hope you can find somewhere that sells inari sushi! Elssha – They are supposed to be squishy, although I can see how looking at my pictures one would think that they are crispy! I hope you like them! Hmm, after re-reading this, I bought a completely different kind. They are dry and the package is a thin plastic clamshell style- like the kind you’d buy knishes in, actually they even look like knishes and I wound up cutting the one I made in half, it wasn’t already open. Interesting. I have to look for these instead! Interesting. I have never seen those before… it sounds to me like the ones you got are uncooked, while the ones I get are pre-cooked so you only have to heat them up before you eat them. Fascinating to hear about all the different ways you can find aburaáge (the fried tofu pouches)!! I live in england, does anybody know if any english supermarkets sell Aburaage?? You might try Japanese Kitchen… it looks like they have them. You also might try Arigato Japanese Supermarket or Japan Centre… I’m not sure which would be closest or most convenient for you, but that’s what I was able to find online. Hope that helps!